Do you notice how your older relatives always start a sentence with “back in my day” when they’re about to complain? Like clockwork I would hear my mother criticize today’s gas prices, food prices, electricity… anything to do with money when compared to a few years ago. Now I’m beginning to fear I’ll start all my grievances that way if brick and mortar stores fade away in favor of digital-only distribution. I’m usually alone in my preference of buying merchandise at physical locations vs. the internet marketplace; everyone loves the straightforward process of placing items in their cart, buying it all at once, and receiving their items as fast as the next day. Though I love what eBay and Amazon have contributed to my life (I type as I stare longingly at my Sackboy controller holders), I can’t help but generally prefer brick and mortar stores. I also feel like there’s more accountability with in-store returns, because you’re speaking to someone who has to assist you face to face, and if there’s an issue it’s easily escalated to the proper managers until the matter is resolved. Some online distributors can simply ignore your complaints, that has happened to me before. When you need items quickly due to some last minute emergency, it’s easier to buy these items at a brick and mortar store vs. waiting for shipment (even if it’s next day shipping). 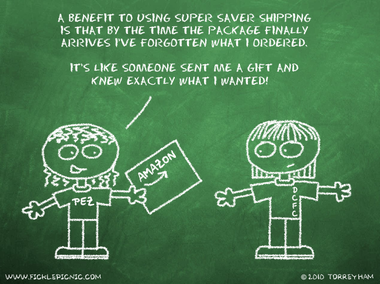 Then there is the shipping itself, which you can either pay upfront per item or pay a $70-90 annual fee on Amazon or Kmart altogether. The fee option comes out cheaper only if you order 20 items or more from the website. 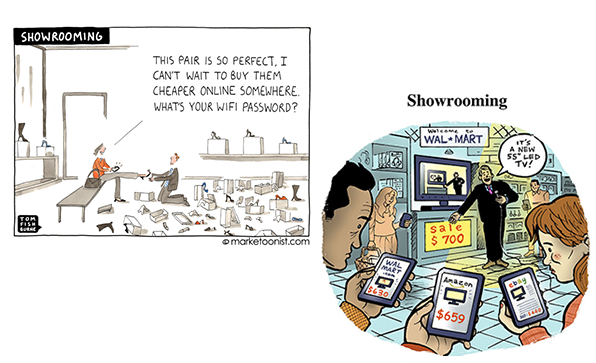 I admit that Amazon and eBay tend to be cheaper than retailers, and quite frequently I do what the first comic depicts of taking a picture of a desired item and looking it up online for less, but that just highlights how retailers need to stop fighting the digital trend and embrace it. To stay current and competitive, they need to change their tactics with online distributors, and even their own websites, with tactics like price matching. Essentially the extra money you’re paying in store is for convenience: the then and now prospect of observing the item in your hands and having the ability to walk out with it vs. the searching, buying, shipping of online purchasing. But it’s apparent that’s not enough for consumers anymore, so it’s time to start assimilating. Retailers may lose some profit on the item, but it’s better than having no profit, which is essentially what’s happening. Target finally came to this realization, given their updated Low Price Promise price matching of Amazon.com. Retailers should also start having the same deals in their brick and mortar stores that they have online. It looks bad when a retailer offers an item online $50 less than the price that’s in the store. To the customer, it seems like there’s a disconnect within the company itself, decreasing their trust and satisfaction with the store. Once stores begin to learn from their blunders, they’ll see improvement with in-store purchases, and less of them will close down. I understand the appeal of online shopping, but I don’t comprehend wanting all brick and mortar stores to go away, as some of my friends have expressed. I like trying on my clothes before making a purchase; seeing a dress on a skinny model doesn’t give me a good indication of how it would look on me. Plus, there’s still a portion of the population that’s not internet savvy, so they need malls to wander in too. Well, I’m off to buy 5 new computers from newegg.com!